Our toolroom features high quality machines manned by very knowledgeable toolroom machinists and toolmakers. We have full toolroom capabilities including milling, turning and grinding. At AMT, we study the various methods to manufacture a precision component and then create the tools, procedures and fixtures from the collective wisdom of our forty- five employees. Unique and specialized fixtures are built with critical final part shapes fabricated by EDM after heat treatment. 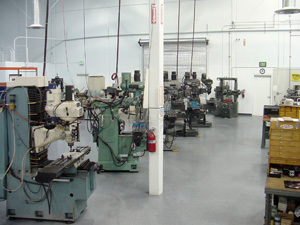 Our tools are first class and allow us to maintain very close tolerances while machining. Jigs, Fixtures, Tools & Dies Made to Exacting Tolerances and Assembled Complete. We will work with you to create the solution to your manufacturing or machined part challenge. Our in-house skilled personnel include: Toolmakers, Engineers, CNC Machinists, EDM Specialists, Master Machinists, and CAD Programmers. Our AMT Designed tools will provide turn-key requirements solutions without relying on outside organizations. At AMT, our focus is high quality parts that exceed our customers' expectations. We are service oriented and will work with you to find the most cost effective approach to manufacturing your parts.